Thanks, I thought the color was festive also. And the frequent tastings make the “wait” palatable. This sounds really good. My one question is that does it have to be nibs? I found this company that makes their own chocolate products and I was wondering if the baking chocolate would be good? The website is http://www.tcho.com. Also for the filtering, I found on youtube a guy who did skittle vodka and used an Aeropress to filter. Do you think that might be able to save some time? Thanks Kenley! And thanks for clarifying about your blog, I noticed a change and wasn’t sure. “Fun size” — I love it! Usually any candy-flavored drinks are too sweet for me–give me gin! Gin!–but I could see myself making an exception for this one. I made an orange and coffee liqueur awhile ago, and it was great, so why not switch out the coffee beans for chocolate? 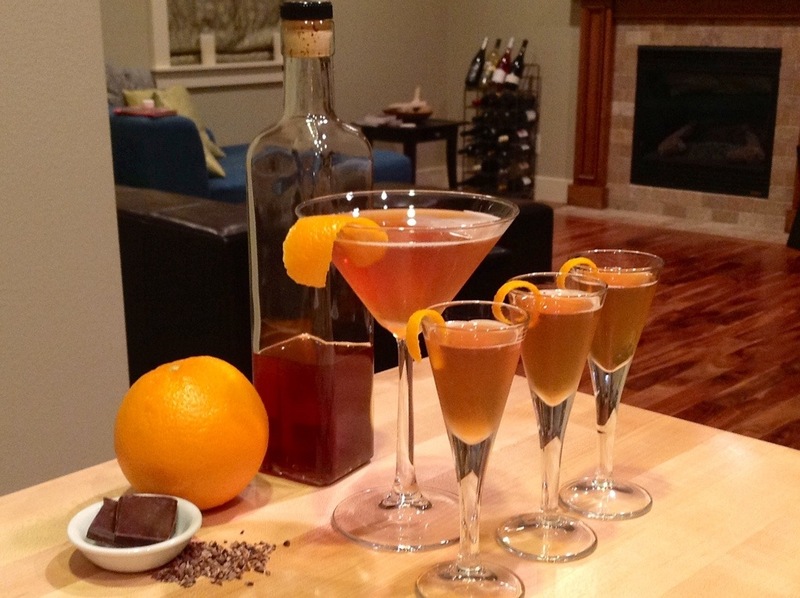 I have seen recipes for the coffee-orange liqueur, but wasn’t sure if I wanted to try it. Now that you have endorsed it… I will need to try it. I know you know your infusions! And for the chocolate-orange, you could leave the sugar out entirely and wait until you strain it to decide if you want to add any sweetener. I like orange and chocolate – but I love raspberry and chocolate – wonder how that would taste? How did I miss that?!?!? I read every post – but then my memory is terrible these days ! 🙂 I will go over now. Sounds awesome! Question about the cacao nibs though…I have some and they are hard crunchy, non-sweet little bits (Nativas brand). Is this the what you used? Or something different? Thanks! Hi Jeni, yes! Those hard, crunchy, bits with no sweetness… Those are the right things! The chocolate flavor will infuse into the alcohol, and the added sugar will give it some sweetness. You can add more sugar if you want, or sweeten your cocktails (as we did with the creme de cacao in this drink). Hi Alicia, the other day I saw some postings on Punk Domestics for candy infusions, including some with with Reese’s pieces that they made shots from. They looked pretty good. 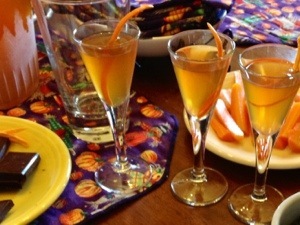 Plus, they had what they called drunken gummies, which looked really cool in the shots glasses. You might like it. I think they actually came from 1finecookie, but I’m not sure. Hi Meg, thanks for the tip! Those do look really cute! Lots of fun candy infusions on there. We make a quick chocolate orange vodka by melting a bar of chocolate orange and stirring in the vodka when it’s cooled a little. Works with loads of different choc bars too. Galaxy caramel is a good one!